Nicole's Needlework: A very good Christmas! Wow, I'm still recovering from all the Christmas Hoopla! We went to my In-Law's house on Christmas Eve. 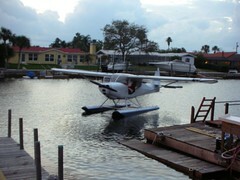 The boys got bikes and went on a Sea Plane ride with the neighbor, who was dressed up like Santa. My husband went with them - I refused to go, I hate little planes. 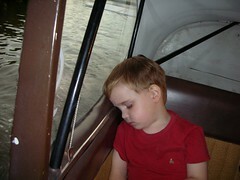 Bradley had fun and Jake fell asleep before they even took off, I couldn't believe it! 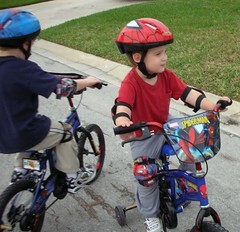 Bradley and Jake on their new bikes. 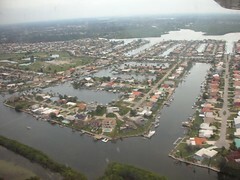 View of my In-Law's subdivision from the plane. Jake asleep on the plane. Coming home finally (I was just a little worried!). On Christmas day we opened presents with my mom and brother and his wife. I got my mom some Cath Kidston pillow cases and you would've thought I was giving her a diamond ring! She was so excited over those pillow cases, it was pretty funny. I got my magnifying Ott-Lite from my Mother-in-Law (I really didn't mean to blurt out that's what I wanted in front of her). :) I haven't really gotten a chance to try it out yet. I also got an iPod, which I absolutely love! 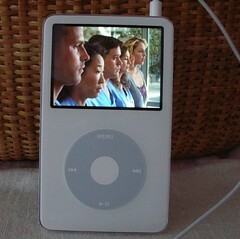 iPod with Grey's Anatomy downloaded on it. 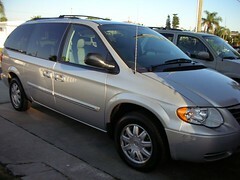 Chrysler Town & Country minivan. I love this car so much! It's so nice - all the doors open automatically, it's the coolest thing! And I can separate the kids - no more fighting in the car, it's wonderful! :) So anyway, I definitely can't quit my job anytime soon, there's no way I could give up that car! :) We all caught a little cold, and it's been dragging me down, so no stitching again tonight - I'm off to bed! Write later! :) Hope you all had a very Merry Christmas! Wow Nicole...I want that car! Great pics. What a very generous Brother you have Nicole - please can he adopt me, I'm really no trouble. Have a great New Year, looking forward to seeing your new finishes. Oh my gosh, a car!!!!!!! Congratulations! You have an A+++ brother! What a wonderful and thoughtful brother you have! Wow, a car, what a great gift. I'm sure you will really enjoy it. Wow - great brother you have! Sounds like you had a great Christmas. I got an IPod last Christmas and I enjoy it so much!